Ali Zafar's marches Awareness walk on World Autism Day. 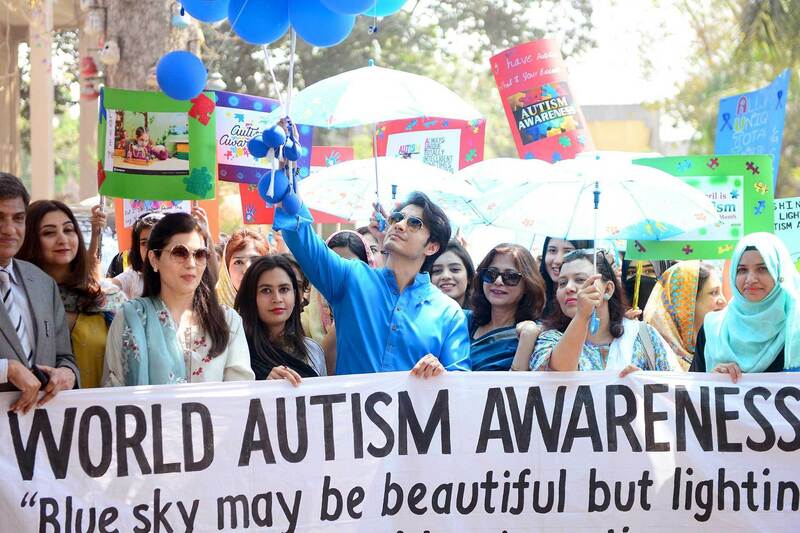 Singer and actor Ali Zafar has marched along with his fellows and general public on World Autism Awareness Day. cause saying that is a good practice to cast attention towards such issues. Actually It is not only the social obligation of showbiz people but all the prominent figures from all walk of life should play their role in solving the society’s common problems and invite people’s attention towards them. Media too has appreciated Ali Zafar’s effort and published reports and pictures of the event prominently. Actually Autism is a mental disease. Unfortunately in our society people do not take any mental disease seriously. They think that physical fitness is enough; if somebody is physically fit he or she should perform all the tasks expected from an ordinary person. But reality is that mental disorder too is a very serious disease and a person who is suffering from any such disorder becomes useless for the society. Rather sometimes he or she becomes harmful for family, society or even for himself or herself..
Autism is a serious mental disorder. Its symptoms include change of mental or physical behaviour. For example he or she sometimes does not speak in spite of physical ability to speak or sometimes does opposite to it. and speaks unnecessarily. Patient’s eye contact is affected and face expressions become dull. Some times the patient does such acts which are not only harmful for others but even for himself. However we cannot give here any final suggestion to this effect because this is a medical subject and a one should consult doctor for any final decision about treatment. It is said that several mental diseases including this one begin in the age of childhood and then develop gradually so it is very important that in case any condition is felt that is not normal, doctor should be approached without losing any time.